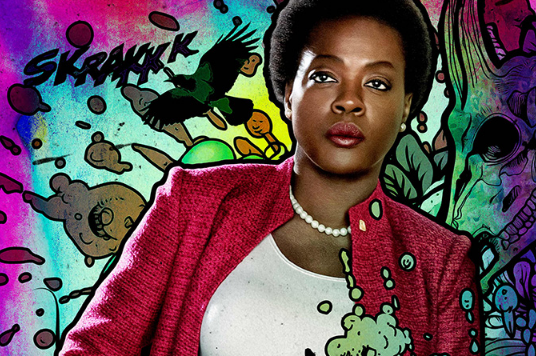 For those unfamiliar with Viola Davis' character of Amanda Waller in the upcoming David Ayer film, Suicide Squad, she may appear to be a staid government suit just there to be a background player. The truth is Waller is just as ruthless and conniving as the supervillains she recruited into Task Force X, the secret black ops team she assembles of expendable bad guys. She's prominently featured in the latest movie trailer in which Rick Flag succinctly declares Waller to be one "mean lady." Created in 1986 by John Ostrander, Len Wein, and John Byrne, "The Wall" is typically portrayed as an unsympathetic, high-ranking government official who uses intelligence, guile, and sheer intimidation to achieve her aims, often in the name of national security.She rose from humble beginnings and tragic events in her life to get her doctorate and become in charge of different security agencies. Traditionally, Waller was characterized as a heavy-set woman unintimidated by the likes of villains and heroes alike. Her appearance recently was unnecessarily updated, thinner, more svelte, but with the same cold demeanor. With a powerhouse talent like Davis, she embodies the force of nature Waller is known for. Check out the trailer and see for yourself. Amanda Waller David Ayer DC Comics movie movie trailer Suicide Squad Viola Davis Warner Bros.
Labels: Amanda Waller David Ayer DC Comics movie movie trailer Suicide Squad Viola Davis Warner Bros.